Dental implants are the new gold standard in tooth replacement, and can help restore your bite's functionality and your sense of confidence. That's why we're pleased to offer a full dental implant procedure (implant, abutment, and crown) for $3,000! In addition, a $125/month payment plan may be available for qualified customers with credit approval. As required by law, the patient and any other person responsible for payment has a right to refuse to pay, cancel payment, or be reimbursed for any other services, examination, or treatment that is performed as a result of and within 72 hours of responding to the advertisement for discounted fee, examination, or treatment. Are you missing one or more of your teeth? Restorative dentistry can repair and restore the natural look of your smile. With restorative dentistry treatments, you can smile with confidence again! For small cavities, tooth colored fillings are an excellent choice. To protect your overall health, our dentists only use mercury-free fillings to treat cavities. Not only are they safer, but they’re also more attractive. Our Coral Springs dental office offers full-coverage crowns, made from luminous porcelain and Zirconia materials. These restorations offer beautiful aesthetic results that protect your natural tooth from further damage or decay. They’re also perfect for topping off your dental implants. Dr. Pinero is certified to use the CEREC dental crown restoration system. 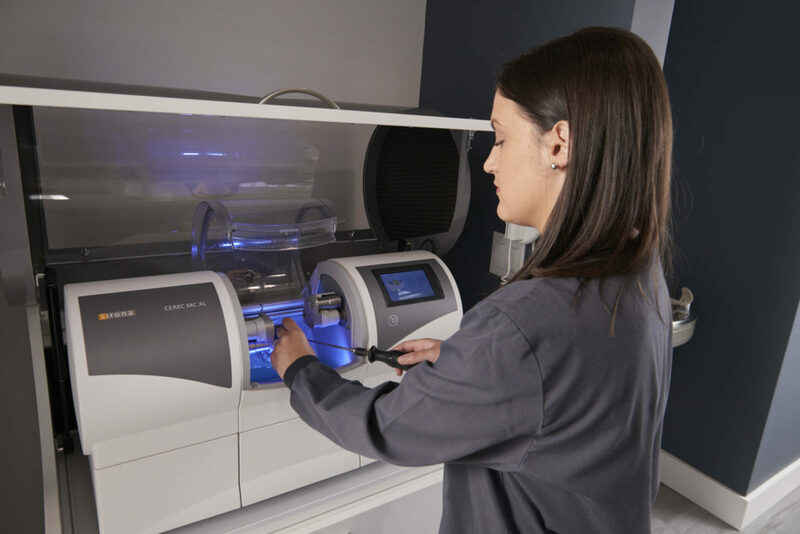 Our in-house CEREC system makes it possible for patients to receive a customized dental crown on the same day of their appointment rather than having to wait 2 weeks for a dental crown to be created and placed. You don’t have to live with a gap in your smile! Our Coral Springs dental practice offers dental bridges, oral prostheses made up of two or more crowns that fill a gap in missing teeth. The crown on either end is called an "abutment," and is bonded onto existing teeth to support the bridge. A dental implant is a small titanium post that is surgically placed in the jaw to take the place of your missing tooth root. Due to its biocompatible properties, the titanium fuses with your natural bone to create a strong base for your replacement crown. Your replacement tooth will be carefully crafted to look natural and fit into your smile seamlessly. Problems with dental implants are rare, but they do happen. If you notice your dental implant has loosened, is causing your gum to swell, or the crown on top of your implant is cracked, call Dr. Pinero to schedule an appointment right away! A dental implant can’t fix itself and if you try to treat it yourself, you could end up causing more damage to your mouth. Have you lost an entire arch of teeth on the top or bottom of your mouth? Are you going to have your remaining teeth removed because they are too unhealthy to save? Dental implant-supported dentures can significantly restore your quality of life. Our Coral Springs patients can be more confident in their daily life with the superior chewing and speaking functions durable implant-supported dentures can provide. For patients missing all of their natural teeth, we offer traditional dentures to give you back the function, feel and appearance of your natural teeth. For optimal aesthetics, we also offer partial dentures. These flexible smile replacements are ideal for partial areas of missing teeth. At Dental Wellness Team, our dentures are custom-made for each patient. However, as your mouth changes and adjusts to dentures, they don't adjust to your mouth. This means that as time goes on your dentures may begin to feel too loose or too tight, you might experience chafing or irritation on your gums. Our dentists are able to offer services to fix these issues and any others you experience while wearing your dentures. If your dentures no longer fit correctly, are damaged or are causing your discomfort, call our Coral Springs dental office today to schedule an appointment. Loss of your natural teeth, whether due to an accident or as part of the aging process, can be traumatic and affect your outlook on life. With the help of full mouth reconstruction, there are many options to restore your smile even if you have suffered extensive tooth loss. Not sure which restorative dentistry procedure is right for you? Call Dental Wellness Team of Coral Springs today to schedule your consultation. With our comprehensive menu of general dentistry services, we help our patients eliminate the bacterial infections around their teeth. At Dental Wellness Team, we're committed to comprehensive, compassionate, and comfortable patient care. We use the latest technology for the best in restorative and cosmetic dental services.